(L-R) Rotary Club of Whangaparaoa president Brian Mullan, Sherry Day, past president Sarah Carr and students of Wentworth College, with Dennis Day (at the rear by the mast) aboard Trillium. After departing Chesapeake Bay, USA and cruising half-way around the world as part of a World ARC sailing rally, Dennis and Sherry Day called into Vanuatu late last year on their 14.8 metre Hallberg-Rassy yacht S/V Trillium. They then sailed to Auckland, NZ and, after a two-month holiday away from sailing, they returned to their yacht. ...Then came the numbing news of death and destruction by Cyclone Pam on Friday March 13 in Vanuatu. Dennis and Sherry talked with friends in San Diego, USA about how affected they were by the tragedy in Vanuatu and how they wanted to do something to help. Fortunately, one of their friends is a Rotarian, of the Old Mission Rotary Club in San Diego, and he suggested that Dennis and Sherry get in touch with Rotary in Auckland. Enter the Rotary Club of Whangaparaoa, NZ which provided an immediate and positive response to Dennis and Sherry. Sherry compiled a list of essential clothing, cooking and other survival items that she knew from experience would be needed in Vanuatu. President of Rotary Whangaparaoa Brian Mullan and past-president Sarah Carr immediately set up two separate Facebook appeals and two separate collection points at their respective homes. Sherry and Dennis were welcomed as special guests to the March 26 Rotary Whangaparaoa meeting, when they again told their story and unfolded their plans to a rapt audience, after which they were presented with a certificate of appreciation by Brian. Dennis and Sherry also appealed to Wentworth College at Gulf Harbour and had made a presentation to them on the much needed items. The students and staff of the college rose to the challenge too, by initiating a similar collection. The collections by Rotary Whangaparaoa and Wentworth College were taken by Dennis and Sherry Day, in their yacht Trillium and on a second yacht, owned by friends. 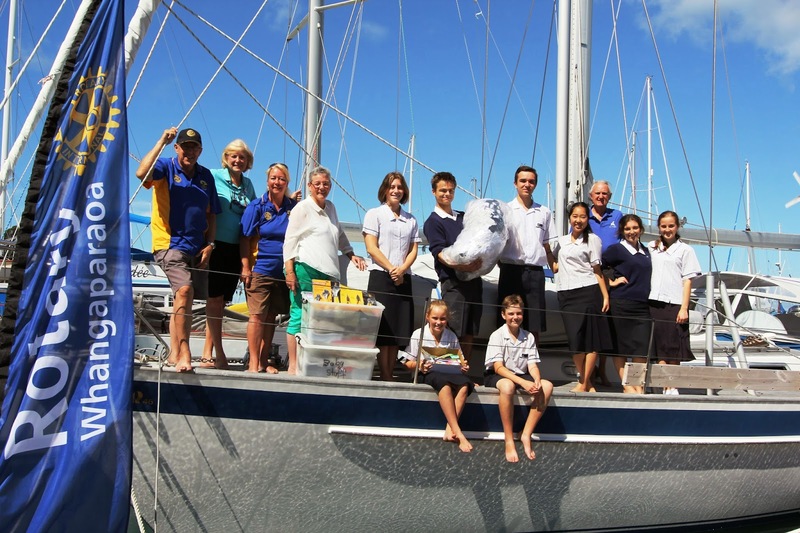 They departed Auckland after Easter and meet with 4-6 other yachts at Opua in the Bay of Islands before all headed up to Vanuatu, and distributed the essential relief items in the more remote outer islands. This is a great example of Rotary providing the practical and effective international links between non-Rotarians with resources and Rotarians with the network and ability to coordinate delivery of much needed relief. There is a great blog for Trillium at http://sv-trillium.blogspot.co..nz and regular updates will be posted by Sherry Day. Vanuatu update: Rotary’s allocated islands are Epi Island and the Shepherd Group of five small islands where Rotary will focus on rebuilding hospital aid post buildings and water collection off the roof. If you can assist Vanuatu following Cyclone Pam, please email the District 9910 Chair of Vanuatu Projects PDG Lindsay Ford ford.rotary@optusnet.com.au.